Hell, it seems, knows no fury like the financial markets being told you are about to become the next Greece. The poor Vice President of the election-winning Fidesz party, Lajos Kosa, had no idea what was in store for him when he calmly announced to a group of astonished journalists that Hungary was in the throes of a sovereign debt crisis not disimilar from the one Greece has been passing through. The value of the forint immediately fell sharply, and a whole army of government spokesmen â€“ lead by incumbent Prime Minister Viktor Orban â€“ had to rush for the microphone to try to clarify that the man didnâ€™t mean what he had just said. There then followed several days of political and financial chaos which saw market valuations rocking across the globe till finally the government issued a series of new measures designed to try and bring the country’s fiscal deficit problem back under control. Thus ended a brief and ill-fated experiment in alternative anti-crisis measures – one which in fact lasted for just under a month (the month we lived dangerously, aka suddenly last spring). Hungary’s new prime minister Viktor Orban has now sharply changed course, and said his government will cut public wages, overhaul the tax system and ban mortgage lending in foreign currencies in an attempt to reassure nervous investors he can contain the country’s budget deficit. 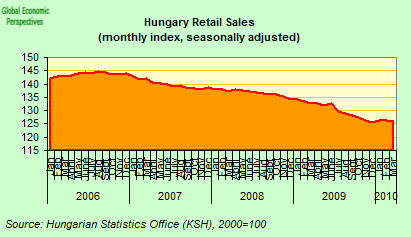 After a sweeping victory in Aprilâ€™s elections, which saw the victorious FIDESZ party elected with a two-thirds majority, the incoming government unveiled a program which departed dramatically from that of the previous caretaker Socialist cabinet that had been following the outline of an IMF Programme introduced after the country narrowly avoided economic meltdown in 2008. Initially the party had pledged to cut taxes and create jobs in an attempt to stimulate the growth the country evidently badly needs to tackle its heavy debt burden, although such moves would obviously threaten targets agreed under the country’s 20 billion euro European Union/International Monetary Fund bailout. 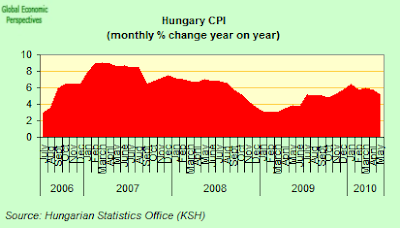 In fact Hungary has – for anyone who looked hard enough – been in an unsustainable fiscal position for some time now (try this article of mine in January, Is Hungary Another Greece?). It was obvious that the deficit was going to be higher than the 3.8% objective – indeed I personally clashed publicly with the Finance Minister (see his reply to me here) on exactly this issue back in January – and that the provisional figures coming out for growth from the statistics office were just a bit too good to be true. Furthermore, the underlying “cashflow” deficit (as in Spain, see charts below) was in fact higher because of the need to fund the losses of state companies and others (like the hospitals and other public entities where the previous government was simply funding the losses by classifying them as unpaid short term debts). Hungary had been lucky until the election in that the financial markets had been too busy with Greece, Southern Europe and the Eurozone to pay the country too much attention. Now that state of grace is well and truly over. But beyond the immediate, headline-catching, story there lurk a number of issues with implications which stretch well beyond the frontiers of the small central European country. The first of these is the high preponderance of forex loans which have been taken out by Hungarian families (largely in CHF, they constitute over 85% of total mortgages). 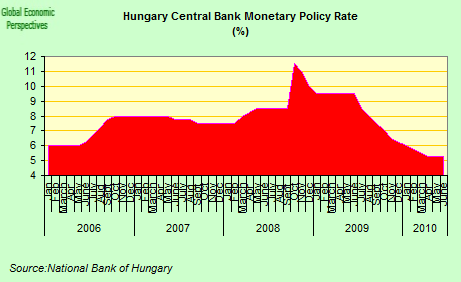 The presence of these loans has been a massive aggravating factor in Hungary’s ability to conduct an effective monetary policy in a context of high inflation and low growth. 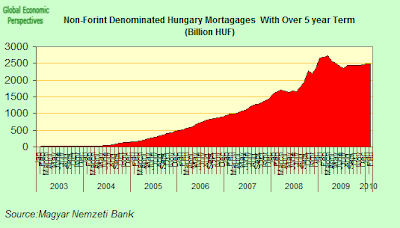 Swiss franc loans are attractive in Hungary, since they are much cheaper than forint denominated ones, since while interest rates determined by the National Bank of Hungary are still over 5%, at the Swiss National Bank they are effectively near to zero. The second issue is the failure of the current IMF programme to return the economy to a sustainable growth path. The Hungarian economy contracted by 7% last year, and even while it grew slightly in the first three months of this year, the level of Hungarian PIB is still likely to fall again in 2010. A 5% increase in VAT last July, and increasing reluctance to take out more loans means that domestic consumption is still contracting, while the public sector has been in an ongoing adjustment process since 2006. This leaves the economy â€“ like its Spanish equivalent â€“ completely dependent on exports to obtain growth. Yet while Hungary now has both a trade and current account surplus, the heavy level of international indebtedness means that the burden of interest payments is heavy, and the capacity to generate export lead growth insufficient. Of course, since Hungary is not a member of the Euro Group the country could devalue its currency, but the high level of external debt makes this very difficult, since the proportion of non performing loans the banking system would have to handle would rise sharply. Finally, we have the political lessons. Having seen the experience of Greece, and now that of Hungary, it must be very clear to all that the traditional ploy of those who win elections against unpopular governments â€“ of blaming their predecessors for the disastrous state of public finances â€“ is now no longer open. The financial markets are indifferent to who is responsible, they simply want to know how the extra debt being made public is going to be paid. So the lions share of their anger inevitably falls on the incoming government. Also, this kind of situation demands a high level of responsibility from opposition parties. This responsibility was not shown by the FIDESZ party. Indeed in 2008 they organised a succesful referendum against the constitutionality of a number of cost saving measures in the health system (see my post on this at the time), only to find that they themselves will have to introduce similar (if not identical) measures. The only casualty here is democracy. Countries facing problems which can lead to national bankruptcy need the maximum political unity and consensus in seeking a way out, and not short term political gests which can only bring more problems in the longer run. If pensions need to be cut, they need to be cut, if the only way to finance them is to issue more debt at a time when markets are tired of buying so much of it. The sooner politicians find the courage to recognise this the better, whether we are talking about Hungary, or other (let them be nameless) countries on Europe’s periphery in similar difficulties. I’m afraid of you are reading to much into Mr. OrbÃ¡n’s statements. The reduction refers to the state-owned companies (15% reduction in the whole amount of wages paid in these companies). Also there will be a 2 million forints limit for the top managers’ wages in the public sector, and they will reform the wage-system in the public administration (or public sector, the statements are not clear). The latter is the closest thing to wage cuts. If so, from this Amerikan’s perspective speaking to Amerika, the cause of death for democracy will be self inflicted wounds. Democracy is not freedom of the press or elections, democracy is the fair distribution of wealth. Over the last forty years, Amerika has betrayed and continues to betray that basic tenet. I would say, that FIDESZ governed quite well from 1998 to 2002. Probably, they were the best democratic government after 1990 so far. Thus, one can have good expectations. It can be quite harsh that in 2010 they get back a ruined country, with few possibilities to control what is going on because of the fixed budget deficit. The case of the foreign currency loans is one of the worst time bombs of the socialists. Concerning “cost saving measures” the author mentions: This is not only economy, but also psychology. The Socialist-Liberal (sorry for liberals but, they called themselves like that) government was probably the most corrupt in the last 20 years. And very much ahead of the candidates for the second place. They were incredible. Basically, any large system reorganization by them would have been resulted in a failure and incredible stealing. See the case of Budapest metro line 4 that is a parody, there are still unfinished holes all over the city, and it costed N times more than any other metro in the worlds. So, changing the subject a bit, I want to make sure I understand the PIGS problem properly. These countries currently have such large amounts of debt and spending, and economies which are going nowhere, such that they are on the edge of failure, where failure is the inability to roll-over the shorter term loans they possess, either at all, or at rates they can afford. If they continue to borrow, the dig themselves further into debt, since they’re borrowing too much as it is; which will kill them. If they can’t borrow, they have to balance their books NOW, which will be cataclysmic. So let us consider Greece. They currently use the Euro and by doing so, their borrowing is cheaper than it would otherwise be. If they went back to their own currency, they could devalue, but they couldnâ€™t borrow – either at all, or at rates they could afford. So they canâ€™t leave the Euro. They have to then rein in their spending, *rapidly*, to get themselves heading back to fiscal viability. This however is socially non-viable, since any party which inflicts this kind of fiscal tightening will get voted out of office. Not to mention all the riots, etc. So I canâ€™t see them actually sorting out their spending. This means they either get huge pots of money from outside – which also wonâ€™t happen, in the end, since parties in the stronger EU countries (such as Germany) which take this course are going to be voted out of office – or they come to the point where they cannot borrow, either at all, or at rates they can afford, and this means they will fail to roll-over their short-term loans which means they have defaulted; no one will then lend to them, and they have to balance their books NOW, which will be cataclysmic. This I think is the outcome for Greece and Spain. Italy seems okay for now, ditto Ireland. So if we consider Greece and then Spain defaulting, what happens to the Euro? obviously, it is significantly weakened. My particular view on this is whether or not to take a mortgage (in euros) to buy a house now, in Amsterdam. It seems to me I should, for these events would be in my favour; I donâ€™t see house prices much changing, but I see the euro becoming worth much less, which reduces the value of my debt. Oh – if a countries does default on its euro debt, it can then revert to its own currency; and I think it would, for staying in the euro would no longer bring any advantage. And why is Mr. Krugman talking about Chermany, Mr. Hugh? Isn’t him a bit worried? What happens to USA and UK productivity? there is not so much similarity in PIGS as you propose. Greece has an unsustainable sovereign debt problem, which can not be resolved, default is just matter of time. Or exit of Eurozone, conversion of all debt private inclusive to Drachma, and switching strong inflation to reduce the debt then in Drachmas. 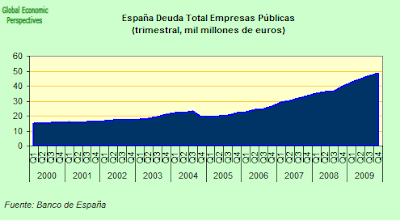 Spain has no problem of sovereign debt, as has been the case of Ireland before NAMA. Their problem is the unsustainable private debt leading to banking system failure. Normally they should let the banks sink, and immediately replace them by governmental banks. At the moment private banks are the sacred cows of the EU and ECB, but that can change rapidly. Portugal is characterised by uncompetitiviness in a monetary union. This problem is a new economic phenomenon, there is very few research on it. It is clear that this uncompetitiviness persists because two main exporters of the EU – Germany and Netherlands – have built their competitiveness based on wage dumping and creating enormous low-wage state-subsidized low-wage sector. EU competition principles have been violated here enormously by DE and NL. The EU-conform de minimis principle of state aid has been violated by orders of magnitudes. The uncompetitivness issue and massive violation of de-minimis by Germany and NL can have very far reaching consequences â€“ it undermines the existence of the EU. As far as monetary union and structural funds outweigh ca 30-40% of uncompetitiveness losses in PT, CEE and others, they somehow accept this. But in 2013 structural funds will end, so there will be much less reasons by uncompetitive countries to follow this strategy.